One of the almost undisputed findings of contemporary policing studies is that the past few decades have witnessed a far-reaching pluralization of policing. Many countries, in different regions of the world, were confronted with the rise of new non-police providers of policing services. Increasingly, the myth of one organization (the public police) with a monopoly on policing lost its power of persuasion as a valid description of reality. Generally, the new agencies of policing concentrate on the management of petty crime and social disorder in public places. With this new situation, multiple providers, both public and private, have become involved in the prevention and management of crime and social disorder. It is often assumed that this development of the past three decades created a more or less quiet revolution (or what Bayley and Shearing (1996) called a ‘watershed’) in the systems of crime control and law enforcement. Although this claim has been disputed, also in the Anglo-Saxon world (Jones & Newburn, 2002), the proposition of the pluralization of policing often seems to have reached the status of a universal, world-wide trend. Until recently, however, outside the Anglo-Saxon world there has been a lack of empirical studies on plural policing. With the exception of the collection edited by Jones and Newburn (2006), the recent study by Terpstra, Van Stokkom and Spreeuwers (2013), and the volume edited by Edwards et al. (2014), there were no other international comparative studies of this issue. As a result, until now the claim of a universally similar trend of plural policing has remained largely uncontested. In fact, the absence of international comparisons implied that theories and explanations of plural policing were based only on a limited (Anglo-Saxon) sample of countries. As a consequence, there was an unanswered question concerning the extent to which descriptions and explanations of plural policing were also relevant to understanding recent changes elsewhere. For example, one question that must be asked is if there is something like a Western-European style of plural policing? Or are the differences between these European countries so great that the developments in policing cannot be gathered under a single conceptual label? (1) Elke Devroe is master in criminology, associate professor in Public Administration, university Leiden, campus The Hague. She teaches in the international master ‘Crisis en Security Management’ (CSM) the courses ‘Governance of crime and social disorder’, ‘Evidence-based policing’ and ‘Research Design’. She conducts research on plural policing and governance of local security problems in particular on incivilities. (2) Jan Terpstra is professor of criminology at the University of Nijmegen, the Netherlands. He published books and articles about policing, local public safety policies, (private) security and criminal justice. Recently he published the book Who patrols the Streets? 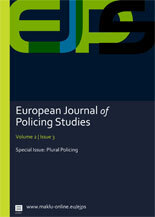 (coauthors B. van Stokkom and R. Spreeuwers) about plural policing in an international comparative perspective, and the book Centralizing Forces? (co-editors N.R. Fyfe and P. Tops) about police reforms in several Northern and Western European countries.